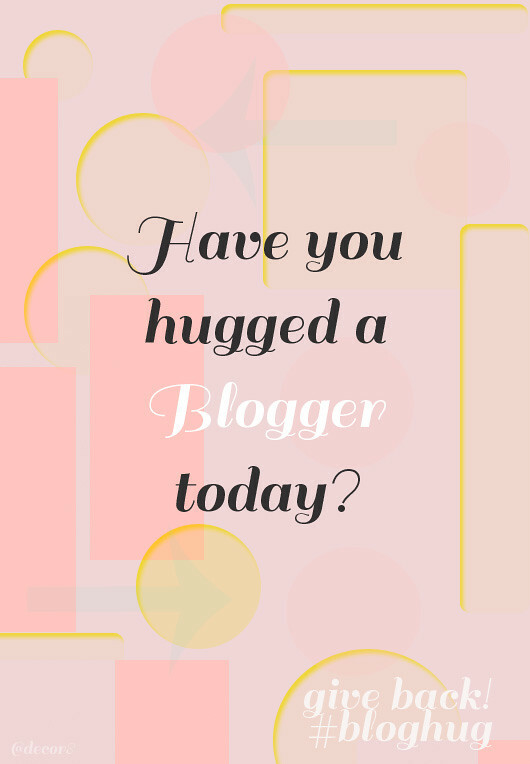 #bloghug - Show Your Love! It's time for a hashtag party - care to join? It's called #bloghug but first, why I'm bothering to do this? I was thinking a lot lately about the connections we make online and the connectors who lead the pack in this effort (maybe one of them is you) and how some have told me that they feel like their hard work isn't a) getting them anywhere b) receiving much feedback OR that c) they aren't really feeling so excited lately about blogging. I thought #bloghug could help spread a little internet cheer. Seriously, have you? Not in real life... I'm talking about a virtual hug, a virtual high five. Maybe this week you can comment on their blog, "like" their Facebook page, send them a friendly tweet - simply to say YOU ROCK. 1) Write a blog post about your favorite bloggers or blogger and tweet it to me (@decor8) with hashtag #bloghug so I can pin it. 2) Make a video and post it on your blog and tweet the link to me (@decor8) with hashtag #bloghug so I can pin that, too! 3) Get creative! Have someone snap your photo of you reading a favorite blog on your iPad (just not your own LOL! ), or holding a sign that says "I Love Blogs #bloghug" or something that just shows a little love. You can use Instagram for this too - just tweet the photo to me (@decor8) with hashtag #bloghug with a link to your instagram.com page so I can pin it! Here are some previous hashtag parties I've hosted with themes: #stripemania & #discomania to give you some ideas. Here is the #bloghug board on Pinterest where I'll pin your stuff!